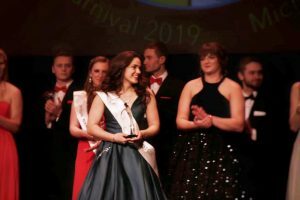 The 2019 Winter Carnival Queen is fourth year Biological Sciences pre-med major Jill Poliskey. 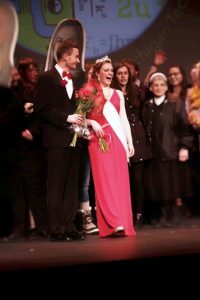 The Midland native was crowned Saturday night during the Queen’s Coronation at the Rozsa Center. She was also named Miss Congeniality. Poliskey represented St. Albert the Great University Parish and was sponsored by Suomi Home Bakery & Restaurant. Third year Mechanical Engineering major Rachel Violassi from Davisburg, MI was the 1st Runner-Up and the Audience Choice. Violassi represented Alpha Gamma Delta and was sponsored by Cyberia Café. The 2nd Runner-Up was fourth year Computer Engineering major Natalie McGrath from Ham Lake, Minnesota…representing Army ROTC and sponsored by Maurices. 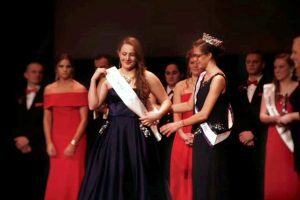 Bios for all of this year’s Queen Candidates can be read here. Michigan Tech’s Winter Carnival events continue through the weekend with the All-Nighter Wednesday evening and the snow statue judging Thursday morning.